Being a 100% Asian means that I have been 'blessed' with almost invisible lashes. Hence, the interest in lash serums. I have tried the old Foltène Lash Treatment, both the old and new Canmake's Lash Care Essences, The Face Shop's Eyelash and Eyebrow Nutrition Liquid, Brow Lash EX's Long Grow Repair and Ardell's Brow & Lash Growth Accelerator Treatment Gel. To cut straight to the point, the old Canmake one curled my lashes and I noticed growth ONLY with the Ardell one. It stopped after a while though. The rest, as much as I can discern, did nothing. I was very disappointed with the Foltène one since it sounded most promising and was the most expensive. BUT (Every story has a 'but'. Tsk. Annoying, isn't it? *grins*) after reading lollipop26's entry on it and because Watsons had a September special, I decided to buy it. 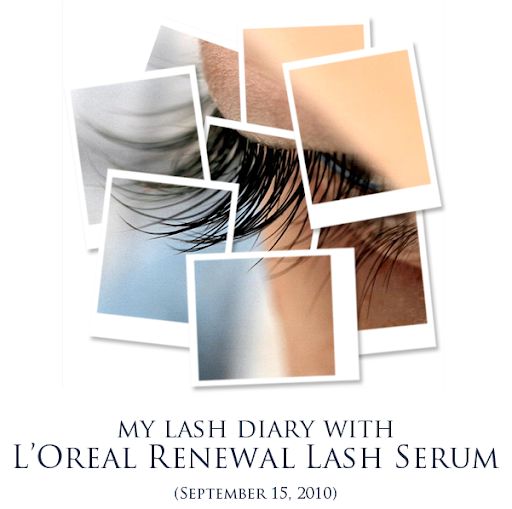 I started my lash 'diary' on September 15th (Okay, it's not exactly a 'diary' since there are only 2 'entries'. Pathetic ones. Ugh. I should have planned properly! Anyway...). I got the L'Oreal Paris' Renewal Lash Serum at a discounted price of $21.90. 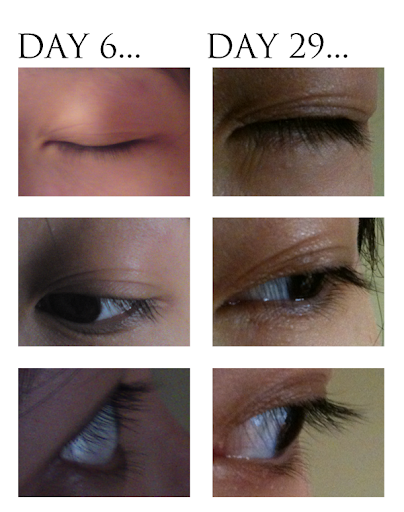 I applied the serum on my upper and lower lashes only at night, after washing my face. During the first few days of applications, I woke up to fallen lashes. It was just one or two strands, but I didn't experience any of that when I was using the Ardell one. I know lashes do drop, but it's just that with the Ardell one, I didn't wake up to lashes on my face. But for the L'Oreal one, I did. So I'm guessing that the L'Oreal one did cause my lashes to drop a little. (Very rarely do I rub my eyes when I wake up. I used do it a lot, but not anymore.) I was pretty alarmed but I mean, hey! It worked for lollipop26! So I carried on with it. Throughout the 29 days, lashes did drop. Each time it was a strand or two. Stronger lashes? I'm not exactly sure what 'stronger lashes' mean here. I'm guessing that it means that the lash strand is thicker. If that's the case, no. 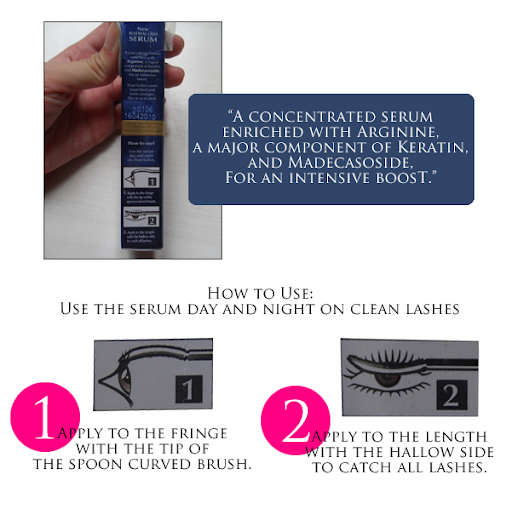 So yep, here ends my verdict on the L'Oreal Paris' Renewal Lash Serum. If you ask me if you should get it, I'll recommend Ardell's Brow & Lash Growth Accelerator Treatment instead. Dor and her mum used it too and both noticed length. But I guess, there's a limit as to how much your lash can grow, so the growth is going to stop after a while. I tried to do a more professional-looking layout for this review. But I think that I should go back to my doodlings. Heh.